We’ve been quiet for the last week – mostly owing to annoying landlords, motorsports schedules and lack of time to do any meaningful eating. Sozzcumber. 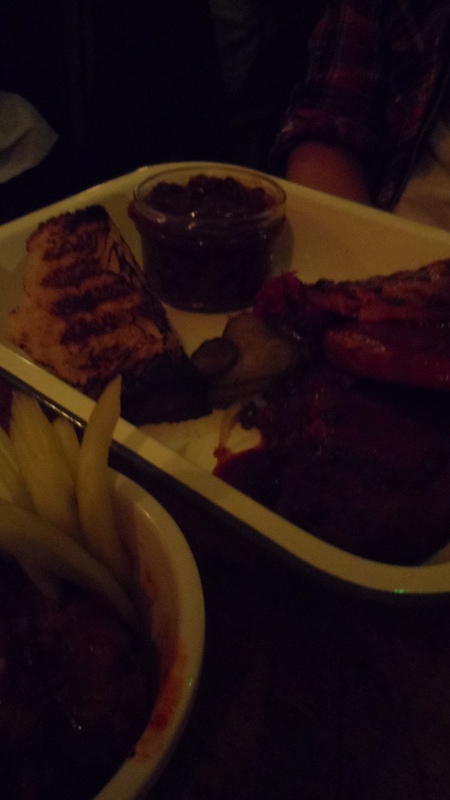 Anyway, we decided to rectify this situation with a foray into a big plate of meat at Pitt Cue Co. on Friday night. Neither of us had got the chance to taste its wares as a van, which meant double the anticipation in the queue. Which, while the best part of it was outside, took about an hour (with the last part of this being over Picklebacks and Godfathers inside the upstairs bar) – not bad considering we got there at 6.30 on a Friday night. I know I’ve griped about no-reservation restaurants before, but once you get inside the belly of Pitt Cue Co., you do end up shrugging ‘fair enough’. It’s tiny – room for 20 covers downstairs and that’s with everyone sharing tables. So I’ll let it go. This time. You’re welcome. But anyway, we digress. Our modus operandi was to try to order one of everything, which we very nearly did. The perk of Pitt Cue is that you basically tack on a full-sized ‘guest meat’ portion to your main meat for just an extra fiver and all the sides are very reasonable indeed. Plate 1: St Louis ribs with pulled pork. Some of the best pulled pork I’ve had outside the US, smokey and barbecuey but – and this applied to the BBQ sauce in general – not so full of vinegar that it leaves you bemoaning the roof of your mouth by the end of a sitting. 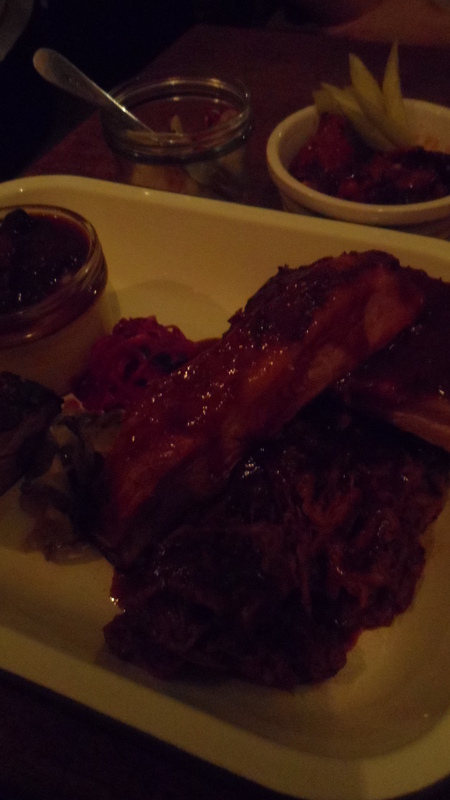 And the ribs – which very nearly ripped cleanly off the bone – were tender and unctuous without excessive (although delightful) fat. Plate 2: ‘to the brisket’. Piled high with massive slices of the day’s special – spicy sausage slices that made you imagine the sausage from whence this came as some kind of giant draught-excluder. We’d eaten some of this in the queue and it was enough of the salt and the spice to make us insist on eating some more once we got in – combined with the beef it was a saltier plate than the aforementioned pork platter, but still an amazing combination of sweet, sour and smoke. We may have slightly overdone it on the sides, but each of them was so, so worth it. First up, burnt ends mash – silky and creamy with the genius topping of the burnt BBQ bits. No mash should really be without it. Sat next to it, a pot of beans that were so smoky and cowboyish that the resemblance to their distant cousin, the radioactive syrup in a blue can, was even slighter than my family photo lineups. Yes, exactly. What made Pitt Cue Co. particularly special was a dedication to the art of pickle. It’s this kind of thing that I have to explain to my dentist when I get told off for my acid erosion. The meat arrives with pickled cucumber and cabbage that isn’t just ‘we dumped this in a jar with vinegar and mustard seeds’, but sweet and with hints of fennel. The hot wings arrived with pickled celery and the full pickle jar – at only about £4 – was a little pot of vinegar treats. Crunchy pickled shittake mushrooms, celery and fennel. The kind of thing I’d eat with every meal if it could be rendered socially acceptable. We left Pitt Cue Co. having realised we’d drastically over-ordered, feeling so full that making the trek to Bar Italia for a much-needed espresso was like carrying quintuplets in the third trimester. It was amazingly reasonable – we ended up at £30 a head with a couple of cocktails and far, far too much food. It could be easily do-able at £20, worth an hours’ wait and worth the meat pregnancy.